As stylish as it is durable, this sink by Kraus makes a terrific addition to any bathroom. Thanks to its sturdy ceramic construction, this sink will maintain is stylish appearance through all kinds of everyday wear and tear. Clean up in style with this top-of-the-line sink, perfect for a wide variety of bathroom designs. Give your bathroom a quality upgrade with this elegant, durable vessel sink from Kraus. Even after years of everyday use, the sink's sturdy ceramic construction keeps its beautiful appearance. Perfect for all kinds of bathroom styles, this sink is fantastic choice for your next home improvement project. This sink is crafted with timeless style and top-notch efficiency. Made by Kraus, it spruces up the look of any bathroom. Its sturdy ceramic construction can hold up against years of everyday wear and tear. Next time you take on a home renovation project, make sure to choose this top-notch sink. 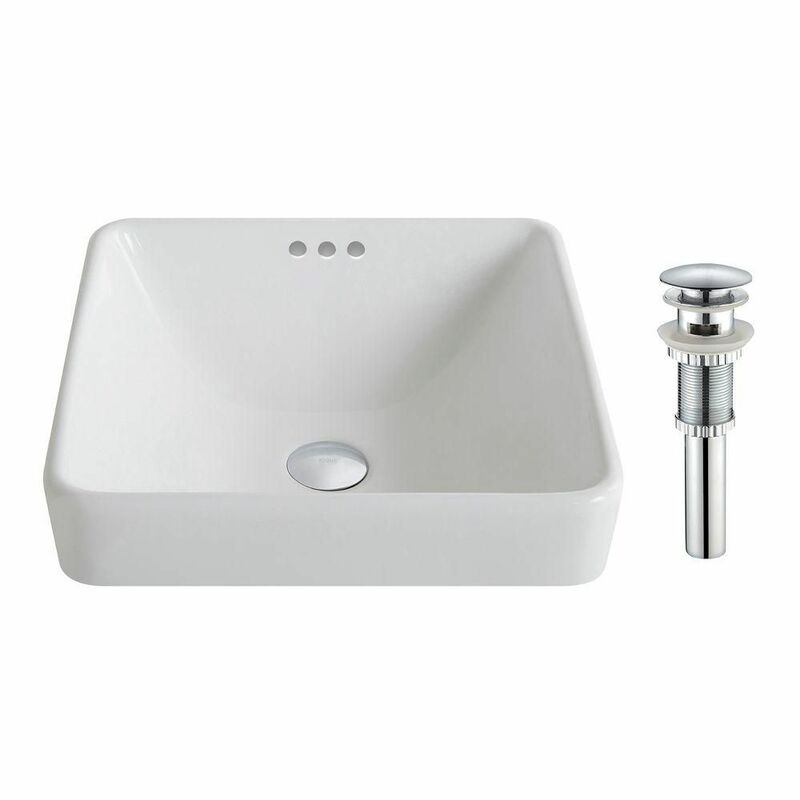 ElavoWhite 16.25-inch x 5.20-inch x 16.25-inch Square Ceramic Bathroom Sink with Drain in Chrome As stylish as it is durable, this sink by Kraus makes a terrific addition to any bathroom. Thanks to its sturdy ceramic construction, this sink will maintain is stylish appearance through all kinds of everyday wear and tear. Clean up in style with this top-of-the-line sink, perfect for a wide variety of bathroom designs. ElavoWhite 16.25-inch x 5.20-inch x 16.25-inch Square Ceramic Bathroom Sink with Drain in Chrome is rated 5.0 out of 5 by 6. Rated 5 out of 5 by Uncle Steve from Bathroom sinks with overflow drain We were so pleased with this sink and drain after installing 2 in our upstairs bathroom that we purchased 2 more for our master bathroom. Very easy to install. The finished product looks great!